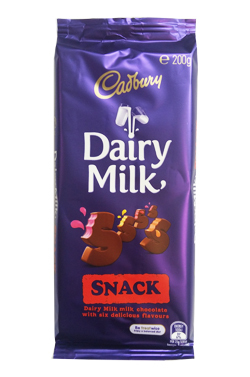 Block of Cadbury Snack filled with 6 different flavours. Strawberry, pineapple, orange, coconut ice, Turkish Delight and caramel. Full Cream Milk, Sugar, Cocoa Butter, Cocoa Mass, Wheat Glucose Syrup, Milk Solids, Invert Sugar, Sweetened Condensed Milk, Golden Syrup, Strawberry Conserve, Emulsifiers (Soy Lecithin, E476), Coconut (contains Sulphites), Palm Fat, Glace Pineapple, Mixed Citrus Peel, Food Acids (E330, E311, E260), Vegetable Gum (E440), Colours (E163, E100, E160C, E160A), Flavours, Salt, Stabiliser (E450), Raising Agent (E341). Heaven in a chocolate bar!